The previous post in the Ecumenical Calendar of Saints’ Days and Holy Days series started with research into one person and led to the addition of six others as well. This post began with research into one person (Schlicht) and led to two others–a father and a son. I also found areas of overlap with the previous post in this series. Ludolph Ernst Schlicht (1714-1769), who attended the seminary at the University of Jena, arrived at Herrnhut, on the estate of Count Nicholas Ludwig von Zinzendorf (1700-1760) near Berthelsdorf, Saxony. There Schlicht spent most of his time sharing his musical talents with young people. He joined the Unitas Fratrum in 1739, became an ordained minister three years later, and served congregations in Ireland and England. Schlicht began to serve the congregation at Bedford, England, in 1753. Music has long been important in the Moravian Church, so one ought not to find accounts of Moravian clergymen who were also musicians surprising. Schlicht, a skilled musician, used that skill for the glory of God by playing in worship services. He also composed hymn texts, anthems, and cantatas. Among the hymns were “Immanuel, We Sing Thy Praise,” “Lord, Grant Us, Though Deeply Abased,” and, with Bishop John Gambold, Sr. (1711-1771), “Ye Who Called to Christ’s Service Are.” Schlicht collaborated with Bishop Gambold on the first official British Moravian hymnal, A Collection of Hymns for the Children of God in All Ages, From the Beginning Till Now, Designed Chiefly for the Use of Congregations in Union with the Brethren’s Church (1754). This hymnal contained 1,055 hymn texts reaching all the way back to the Early Church and as late as the 1700s, including texts by great English hymn writers such as Isaac Watts and Charles Wesley. Only fifty-one of these hymns came from the Moravian Church prior to its 1727 Renewal. And, some of my sources indicate, Schlicht probably edited a British hymnal in 1746. The only book which, according to my research, fit that description was James Hutton‘s private collection, The Tunes for the Hymns in the Collection with Several Translations from the Moravian Hymnbook (1742), with its 1746 supplement. John Gambold, Sr. (1711-1771), son of the Anglican Vicar of Puncheston, Pembrokeshire, Wales, attended Christ Church, Oxford (B.A, 1730; M.A., 1734), took Holy Orders and served as the Vicar of Stanton Harcourt (1733-1742). Gambold, who met John Wesley at Oxford, became part of the core group of earliest Methodism. By 1741, however, he and Wesley had ceased to speak to each other. (More than one person fell out with Wesley, probably due to the combination of personality clashes and theological disagreements.) Gambold and Wesley, both whom had Moravian influences, moved in different directions after 1738. Gambold, who met Count Zinzendorf in 1739, preferred the mysticism of the Greek Church Fathers to Wesley’s style of religion. Thus it came to pass that Gambold entered the Unitas Fratrum in 1742. Naught but mercy, truth, and grace. He doth all their wants supply. To offend Him greatly fear. For Thy goodness, truth, and grace. The History of Greenland, Volumes I and II, by David Crantz (1767, with Gambold as the Editor and one of the translators). The Poetical Works of the Late Rev. John Gambold, A.M. (1816). Also, The Oxford Methodists (1873) contains an account of his life on pages 155-200. Bishop Gambold died at Haverford West, Wales, on September 13, 1771, when his son, John Gambold, Jr. (1760-1795), was two months short of being eleven years old. John, Jr., went to study in Germany (at the time a geographical, not a political, designation) in 1774, at age fourteen. There he remained for the rest of his brief life. He studied at Niesky and Barby. John, Jr., aspired to become a scholar yet the Church appointed him to teach young people instead. On the side he composed six keyboard sonatas (published at Leipzig in 1788) and twenty-six vocal pieces. John, Jr., whose health had always been fragile, died at Barby, Saxony, at age thirty-four. The process of preparing these posts about saints is a rewarding one. Along the way I learn of connections between and among people, of some of the circumstances of their lives, of what they did with their lives and strove to do with them, and of their legacies. In this case the process had led me to some conclusions about these three men. They were flawed people, of course, but perfection was not an option. (Who among us is not flawed?) They agreed and disagreed with others, engaged in interpersonal conflicts, sometimes had irreconcilable differences, had positive relationships also, and tried to walk as closely with God as possible. To the extent that they succeeded grace made the difference between that and failure. They also applied their talents to the glory of God. And more of us ought to know their names and some of their accomplishments. This post is an outgrowth of a research project I call Liturgy in the Moravian Church in America, the Prologue to and Part I of which I have posted at BLOGA THEOLOGICA. Having read them (especially Part I) will improve the comprehension of this material. Reading and note-taking for Part II (scheduled to cover 1735-1848) are in progress. In fact, work on this project overlaps with that effort. Recently I wrote names out of a wonderful book, The Music of the Moravian Church in America (2008), Nola Reed Knouse, Editor. 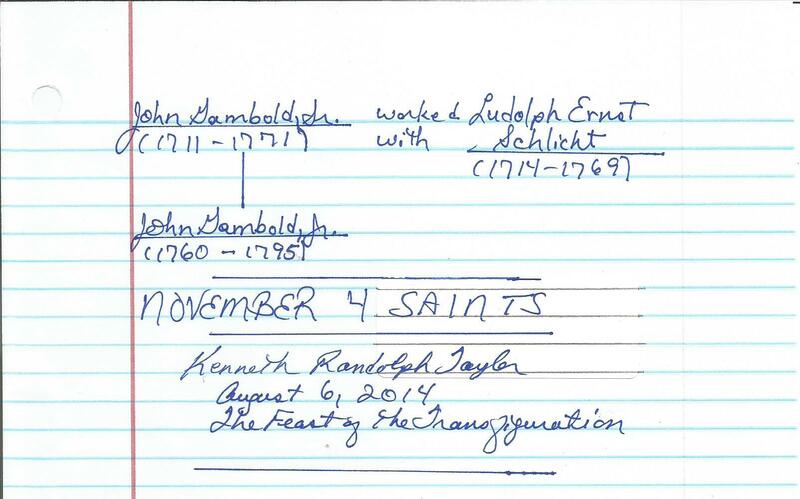 More recently I started taking notes on one man–John Worthington, whom I had penciled in for consideration for a slot on November 3 on my Ecumenical Calendar of Saints’ Days and Holy Days. His biography led me to another person, which led me a third, et cetera. The process ended with seven saints sharing one post. I could have made it at least eight or nine, but a reader absorbs enough details without the author going further into the material in this post. But, just in case you wonder, O reader, I plan note-taking sessions on Christian Gregor and Frederick William Foster, numbers eight and nine, respectively. 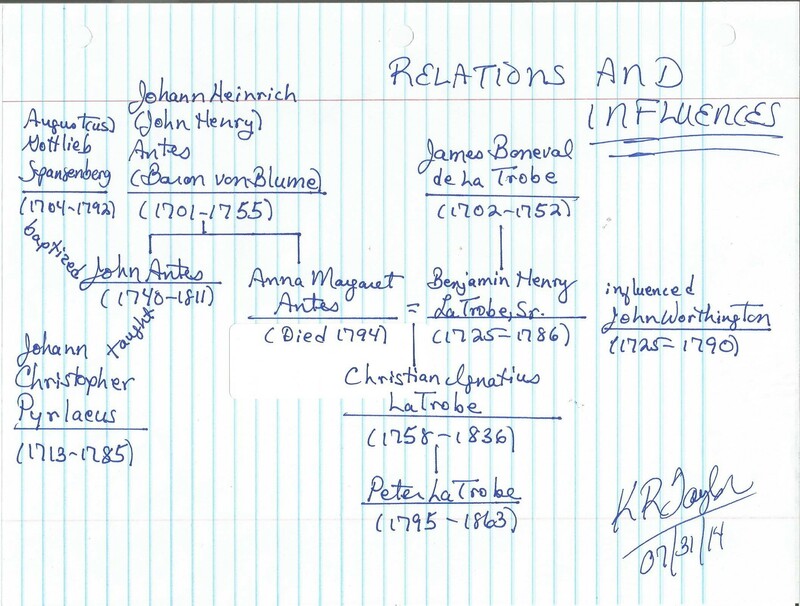 At the heart of the web of relationships and influences on which I focus in this post is a family tree. This fact ought to remind one of the importance of family in nourishing and continuing the faith. There are also three people outside the family tree yet crucial to the story I am telling. This reality ought to remind one of the importance of other human relationships in influencing people, hopefully for the positive. Perhaps the best way to commence the historical narrative is with Augustus Gottlieb Spangenberg (1704-1892). Some sources among the Moravian books I consulted gave his first name as Augustus, some as August, and others as both, depending on the page. He is, for my purposes, Augustus, which sounds properly Germanic. Spangenberg was, of course, German, from the state of Saxony, to be precise. (Germany was a cultural, not a political, designation prior to 1871.) He, the son of a Lutheran minister, studied theology at the University of Jena starting in 1721. He taught at Halle in 1732-1733 then became a Moravian at Herrnhut, on the estate of Count Nicholas Ludwig von Zinzendorf (1700-1760) near Berhtelsdorf, Saxony. Spangenberg became a trusted aide to the Count. Spangenberg was a foundational figure in the Renewed Unitas Fratrum (1727-). He traveled the world on church business, even leading a group to settle in Georgia in 1735. The Georgia mission (1735-1779) was never successful. Disputes internal and external (with the Lutherans at Ebenezer) contributed greatly to the Savannah Moravians’ troubles, but the domestic politics of the War of Jenkins’ Ear (1739-1748) made matters worse. Georgia was a military colony on one of the borders between the British and Spanish Empires. The Georgia Moravians, being pacifists, refused to take up arms against anyone–especially the Spanish enemies. (Governments tend to dislike people who refuse to fight the enemy.) Most of the Moravians in Georgia left for Pennsylvania in 1740. There, the following year, they founded the settlement of Nazareth. The second Moravian mission in Georgia, by the way, was to Native people. It started in 1800 and ended with Indian Removal in the 1830s. Spangenberg traveled widely on Moravian Church business after 1735. In the late 1730s alone his itinerary included Pennsylvania and St. Thomas. And, in 1742, he founded the first Moravian settlement in England. Spangenberg, back in America, became the bishop for North America in 1744. He left for Herrnhut in 1762 to sit on the Church’s governing council and help to stabilize the denomination in the wake of the death of Count Zinzendorf (1760). Spangenberg retired in 1791 and died the following year. His writings included The Life of Nicholas Ludwig von Zinzendorf (three volumes, 1772-1774; English translation, 1838) and the Exposition of Christian Doctrine (1782, English translation, 1784, by Benjamin Henry LaTrobe, Sr.). In 1744 the bishop founded the collegium musicum at Bethlehem, Pennsylvania. This, according to my specialized sources, was his greatest musical legacy. A collegium musicum is a small musical ensemble which fills a variety of functions. It educates its participants, fills time which they might spend otherwise in dubious pursuits, provides wholesome entertainment, and serves a function in worship. These roles were like circles in a Venn Diagram for, as a Moravian ethic says, all of life is liturgical. The original collegium musicum formed at Herrnhut in 1731. The early composition of the Bethlehem collegium musicum changed over time. It started with horn players, added trumpeters the following year, and came to include a harpist and a violinist in 1752. There were fourteen members in 1748. The original leader was Johann Christopher Pyrlaeus (1713-1785), to whose story I will turn in this post. Spangenberg composed hymn texts. Among them were “When Simplicity We Cherish” (1740), “What Can We Offer Thee, O Lord” (1734), “High on His Everlasting Throne” (1737), and “The Church of Christ, Which He Hallowed Here” (1745). Johann Christopher Pyrlaeus (1713-1785) studied music as a young person. Then he studied theology at the University of Leipzig while Johann Sebastian Bach was there in town. At Leipzig Pyrlaeus encountered Moravians and converted to the Unitas Fratrum. That connection brought him to America–Pennsylvania, to be precise. Pyrleaus had an eventful time in America. In 1742, while Count Zinzendorf was serving as a Lutheran pastor in Philadelphia, Pyrlaeus worked as the Count’s assistant. On one memorable Sunday in 1742, in fact, a drunken crown even drove Pyrleaus from the pulpit. From 1743 to 1751 he served as a missionary to Native peoples, becoming the first Moravian musician to do so in the future United States. Pyrleaus, a capable vocalist, organist, and instrumentalist, also translated many hymns into Mohican. He also, at the request of Bishop Spangenberg, organized the first Moravian Indian-language school in the future United States. And, as I have established, Pyrlaeus (from 1744 to 1751, when he returned to Europe) led the collegium musicum at Bethlehem, Pennsylvania. He also provided early music lessons to John Antes (1740-1811). John Antes was a son of Johann Heinrich (Anglicized as John Henry) Antes, the Baron von Blume (1701-1755), who had emigrated from Germany. The Baron, originally of the Reformed Church, came to prefer the Moravian Church in Pennsylvania, so he converted in 1746. Bishop Spangenberg baptized the American-born John Antes, who went on to make instruments, such as harpsichords and violins. In 1759, in fact, he made one of the earliest violins in America. Antes operated his own instrument-making business at Bethlehem from 1762 to 1764 then relocated to Europe for a few years. He settled at Herrnhut in 1764 and moved to Neuweid the following year. His European ventures proved unsuccessful, but he found a vocation as a missionary to Egypt (1769-1781) and an avocation as a composer. Antes, toward the end of his tenure in Egypt (where he also made watches in Cairo), mailed a copy of his Three Trios to Benjamin Franklin, then an American diplomat in Paris. Antes, the earliest American composer of chamber music, nearly died of torture at the hands of Ottoman imperial officials. The part-time composer returned to Europe, where he spent the rest of his days, in 1782. He was at Herrnhut (again) in 1782-1783. Then, from 1783 to 1785 Antes served as the business manager of the congregation at Neuweid. He filled the same role at Fulneck, England, from 1785 to 1808. He died at Bristol, England, three years later. Some of his music has survived. Antes wrote the Three Trios, of course, but also more than thirty sacred vocal works. The Hymnal and Liturgies of the Moravian Church (1969) contains six of his hymn tunes. Unfortunately, a set of his quartets is lost to history, to be best of human knowledge. Hopefully they will join the ranks of music considered lost until someone identified a copy in a library or a collection somewhere. Benjamin, Sr., and Anna Margaret had six children, five of whom lived to adulthood. Two of these were Benjamin Henry LaTrobe, Jr. (1764-1820) and Christian Ignatius LaTrobe (1758-1836). 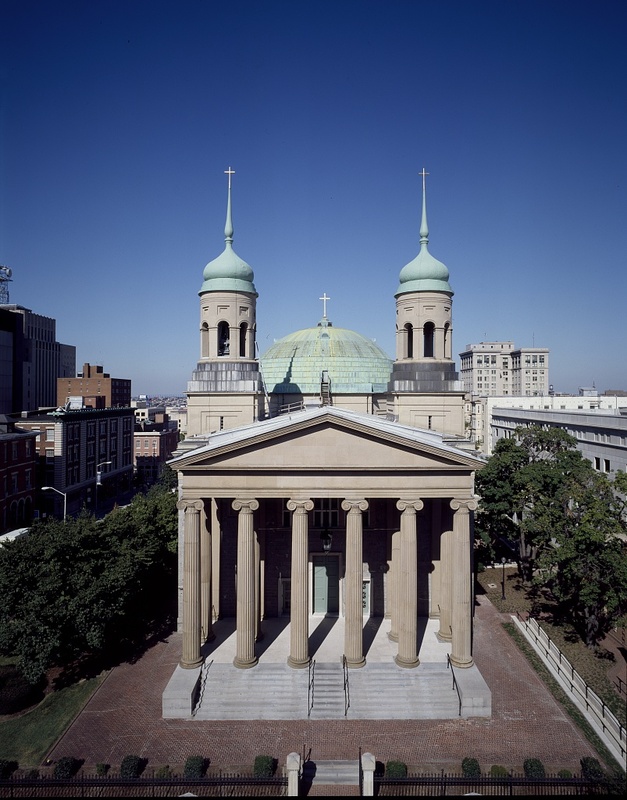 Benjamin, Jr., an engineer and architect, moved to the United States, where he worked on the first waterworks system in Philadelphia, designed interiors (such as the Old Senate and House Chambers) of the rebuilt (post-War of 1812) U.S. Capitol building, and designed the Basilica of the Assumption at Baltimore. Benjamin, Jr., the father of the U.S. architectural profession, died of yellow fever in New Orleans, Louisiana, in 1820. I will turn to Christian Ignatius LaTrobe shortly. Christian Ignatius LaTrobe (1758-1836), educated in Germany from 1771 to 1778, taught at the Moravian school at Niesky from 1779 to 1784. LaTrobe worked from London for many years, administering Moravian missions. He retired in 1834, moved to Fairfield (near Manchester), and died two years later. That was his life in broad strokes. LaTrobe’s other great contribution was musical. He, who knew luminaries such as Franz Joseph Haydn, was, at the time, the only Moravian Church composer with a reputation outside the Unitas Fratrum. LaTrobe composed music for both the Moravian Church and the Church of England. Works for the latter were more complex than those for the former. 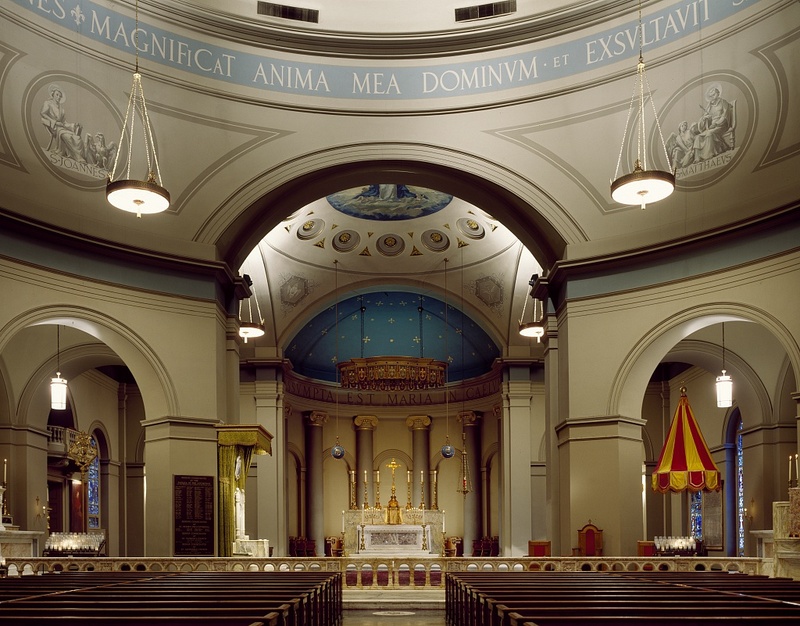 As Bishop Spangenberg, in Europe from 1762 to 1792, had advised the young LaTrobe, who was once a church organist, “keep it simple.” LaTrobe composed and arranged works for SATB choir, organ, strings, bassoon, oboe, and piano forte. There were also “secular” (a term with less meaning in the Moravian Church than in other denominations), such as three piano sonatas, which he dedicated to his friend, Haydn. Original Anthems for One, Two, or More Voices Adopted for Private Devotion or Public Worship Composed and the Accompaniments Arranged for the Piano Forte or Organ (1828). There were also nine organ preludes in an appendix to L. B. Seeley’s Devotional Harmony (1806). Among the children of Christian Ignatius LaTrobe and Hannah Benigna Syms LaTrobe (1758-1824) was Peter LaTrobe (1795-1863). The Hymnal and Liturgies of the Moravian Church (Unitas Fratrum) (1923) contains one, “Sweeter Sounds.” Hymntime.com lists two others, “Fairfield” and “Invitation.” The London-born bishop, who died at Berthelsdorf, Saxony, near Herrnhut, the worldwide Moravian headquarters, married twice. His first wife (1825-1839) was Mary Louisa Foster (1793-1839). The second wife (1842-1863) was Jeanetta Margaret Brett, who survived him. Peter’s first father-in-law was therefore Frederick William Foster (1760-1835), a British Moravian bishop (from 1814) and editor of the hymnal of 1801, its supplement of 1808 (and thus the composite 1809 edition) and the revised hymnal of 1826. Peter updated his father’s 1826 volume, publishing Hymn-Tunes Sung in the Church of the United Brethren First Collected by Chr. Ign. LaTrobe; An Enlarged Edition, Arranged in Parts for the Use of Choirs (1854). and know ourselves to be surrounded by their witness to your power and mercy. and who lives and reigns for ever and ever. Amen.